The Former South Yarra Tram Substation, constructed by the Melbourne & Metropolitan Tramways Board (M&MTB) in 1927. The Melbourne and Metropolitan Tramways Board was formed in 1919 to electrify, integrate and extend Melbourne's existing cable and electric tram routes. Following the formation of the State Electricity Commission (SEC) in 1920, electricity to power Melbourne's electric tram lines was taken from the state grid system at substations. These converted the SEC's 6500 volt alternating current (AC) to direct current (DC) at a lower voltage to operate the trams. Between 1925 and 1940 the M&MTB progressively electrified the old cable tram routes, built new depots and substations, extended the existing tram lines and added new routes. 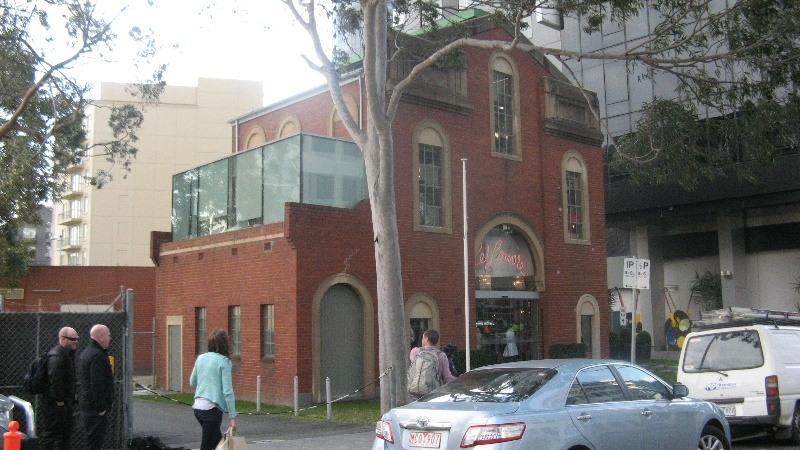 The South Yarra substation was located at the rear of the former South Yarra cable tram engine house and car shed (which are now much altered), and took over its function of powering the Prahran tram line. It was one of five impressive brick substations built in the mid-1920s in the inner suburbs. It was probably designed by Alan G Monsborough, the M&MTB's architect, who was responsible for the design of all tramway buildings during the formative years of the electric tramway system. 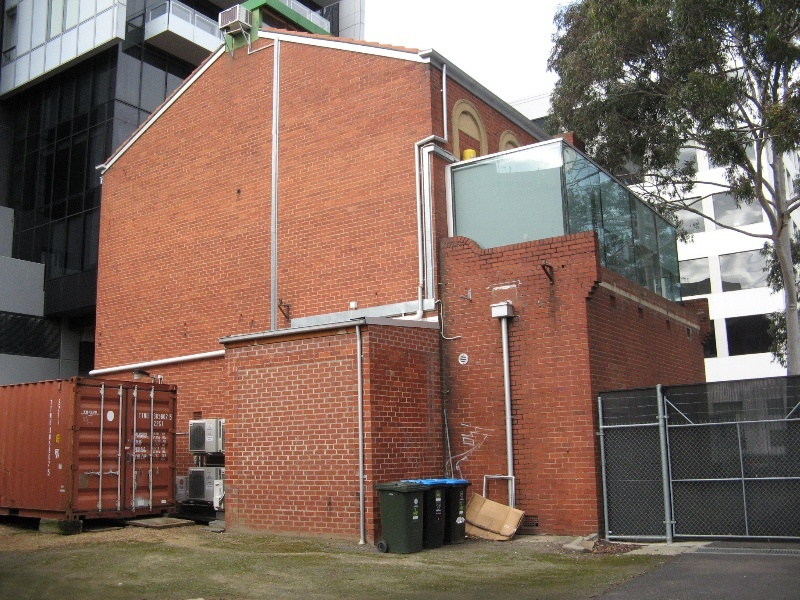 In 2005 the South Yarra substation became redundant and a new substation was built at the rear. 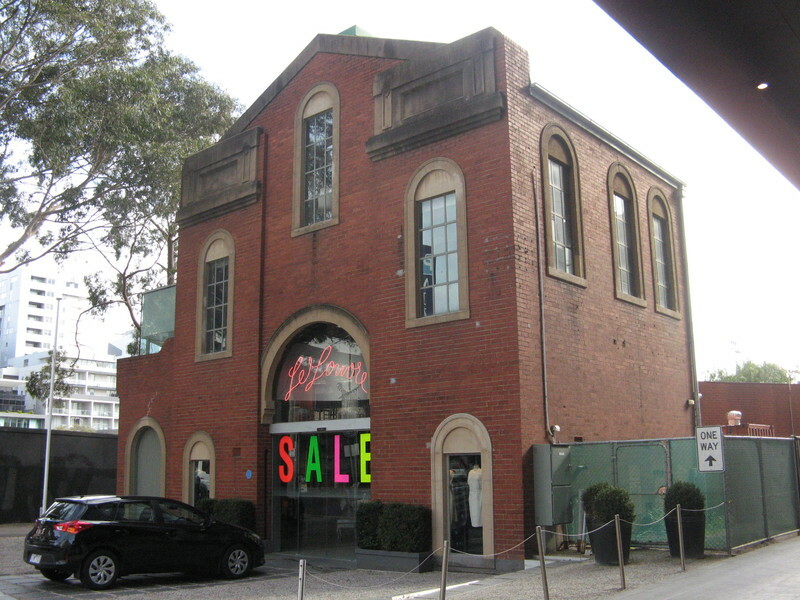 In 2009 the old substation building was converted for use as a ladies wear shop. The Former South Yarra Tram Substation is a tall symmetrical Inter-war Stripped Classical style building of brick, with a large central front entrance for the movement of electrical plant. It has arched steel-framed windows. There are rendered dressings around the openings, a rendered brick parapet and a corrugated iron roof with a lantern light along the ridge. A lower level skillion in a similar style is attached on the west side. All original equipment and fittings have been removed from the interior and as part of its conversion to a ladies wear store the interior has been refitted. All of the place shown hatched on Diagram 2320 encompassing all of Lot 10A on Lodged Plan 9120. The first trams operating in Melbourne were horse-drawn. The first of Melbourne's cable trams opened in 1885 on the Richmond line, and in the following six years the councils of Melbourne and the ten surrounding municipalities built a system of cable-hauled tramways. The 46 miles [74 km] of double track serving seventeen routes radiating from the centre of the city to neighbouring suburbs was probably the world's largest cable tram network, but by 1891 it had reached its maximum extent. By 1900 it was recognised that other countries had established electric tramways that were less expensive to install, and an electric tram had already begun operating in Sydney. The first electric tram to run in Australia was demonstrated during the Melbourne Centennial International Exhibition in 1888. From 1889 until 1896 this pioneer vehicle and a second car ran a regular tramway service between Box Hill Station and Doncaster, mainly as a means of attracting potential land purchasers, but it did demonstrate the viability of electric traction. The first two regular electric tram service in Melbourne opened in 1906, with the opening of a line from the cable tram terminus at Flemington Bridge to Essendon and the Victorian Railways line from St Kilda to Brighton. In the early 1900s, several municipalities formed trusts and built electric tramways in their areas. In 1909 Municipal authorities in Prahran and Malvern combined to form a Trust to operate electric tramways within their boundaries and opened lines in 1910, which by 1919 had grown to a network of thirty-five route miles [56 km]. During World War I other suburban electric networks developed, including municipal trust undertakings in the areas of Hawthorn, Brunswick, Coburg, Fitzroy, Kew, Preston and Footscray. Until the State Electricity Commission of Victoria was formed in 1920, electricity for the trams was provided by various private and municipal power generators. The Victorian Government in 1910 set up a Royal Commission to enquire into the 'present condition of the Railway and Tramway systems of Melbourne'. Their 1911 report recommended electrification of the suburban railway network, and also recommended that all the metropolitan tramways, cable and electric, municipal and private, be vested in a Municipal Tramways Trust, and that the cable tramways be converted to electricity. The advantages of electric tramways were considered to be lower capital costs, greater speed and flexibility, adaptability to extension and simplification of terminal shunting. Implementation of these recommendations was delayed by World War I, but in 1918 legislation was passed setting up the Melbourne & Metropolitan Tramways Board (M&MTB), which in 1919 took over authority for the cable trams, and in 1920 for the Northcote line and all the electric networks operated by municipal trusts. The M&MTB formulated a comprehensive plan for integration and development of the system as a whole, with considerable extension of the electric lines and gradual conversion of the cable lines. The first line electrified was the St Kilda line in 1925, and in less than a month electric trams were serving the whole length of Swanston Street. Within the first year a considerable part of the southern section of the system had been electrified. The last cable tram line (Northcote) only closed in 1940. During this time the cable trams were converted to electric traction, new depots and substations were built, lines extended and new routes added. Hundreds of new, large, electric trams were built to replace the fleets of small cars previously operated by the municipal tramway trusts. With the establishment of the M&MTB new substations had to be built to electrify the converted cable tram lines and for new routes, and to systematise the distribution of power from the Latrobe Valley generator of the State Electricity Commission (SEC, formed in 1920). Electricity to power Melbourne's tram lines was taken from the state grid system at the substations, where the SEC's alternating current (AC) at 6600 volts was transformed (or rectified) to direct current (DC) at a lower voltage to operate the trams. Substations housed the equipment required to transform the high voltage AC power down to the low voltage DC traction power. Since the 1880s electric trams have been powered by direct current (DC) at a relatively low voltage - initially at 500 volts, but in later years more commonly between 600 and 700 volts. DC motors were well-suited to use on trams as they were compact and light and could easily be incorporated into the restricted space on the trams. However direct current has a major drawback: voltage drops quickly with distance and tram performance therefore falls off rapidly if the tram is much more than 4 km from the power source. So substations were usually built near the middle of tram routes. The earliest rectifier systems used mechanical rotary converters with electric motors to drive generators. The initial installations by the tramway trusts were often co-located within the tram depots, such as at Malvern, Kew, Elsternwick, Hawthorn and Coburg depots, which all used massive rotary converters. In the 1930s new technology was introduced, using mercury arc converters, which employed a process involving ionising mercury vapour. These were smaller and were initially housed in glass bulbs and later in steel tanks. From the 1960s the system progressed to solid state silicon diode rectifiers. These are what are now used, together with the extensive use of electronics, to control switching, and require much less space than the old systems. Melbourne had to re-equip its substations in the 1990s due to the higher electric current required to air-condition trams. In order to reduce supervisory labour costs, the M&MTB constructed remote control equipment of its own design for its substations. The main central control room was in Queensberry Street at Carlton, which was able to operate all the other substations remotely. By 1933 there were 19 substations, 15 of them fully automatic unattended stations, and by 2013 there were 55, with more planned. Many of the early tram substations were free-standing buildings, the oldest being the Elsternwick substation built by the Prahran & Malvern Tramways Trust in 1914. The early substations housed the massive rotary converters and required deep foundations to prevent damage to the building fabric. They also had large doorways and high roofs, to permit easy handling of the electrical plant, and large high windows to provide natural light. A series of similar large impressive brick substations were built between 1924 and 1929 by the M&MTB in Camberwell, South Yarra, Ascot Vale, South Melbourne and Carlton, all designed to house rotary converters. All were similar in materials and form but varied in their size, floor plans, and the degree of rendering and decoration. In 2005 a number of Melbourne's substations and their equipment became redundant, including Ascot Vale, Glenhuntly, Essendon, South Yarra, Deepdene, Maribyrnong, Brunswick, West Brunswick, Coburg, Preston and South Melbourne. The old substations were cleared of hazardous materials and new substations were built adjacent to the old buildings. Alan G Monsborough was the M&MTB's architect and was responsible for the design of all tramway buildings during the formative years of the electric tramway system. His prodigious output ranged from electric sub-stations and tram depots to the large scale heavy industrial buildings at the Preston tramway workshops, the board's multi-storey head office building in Little Collins Street, Melbourne, the elevated signal cabin and waiting shelter in Swanston Street (1928, VHR H686) and the rustic chalet and passenger shelters at Wattle Park in Burwood (1920s, VHR H904). The South Yarra substation in Daly Street was the site of a group of tiny houses built in c1885 and owned by a real estate agent called Daly, which acquired the name of Daly Town. The houses were condemned and demolished in 1910. 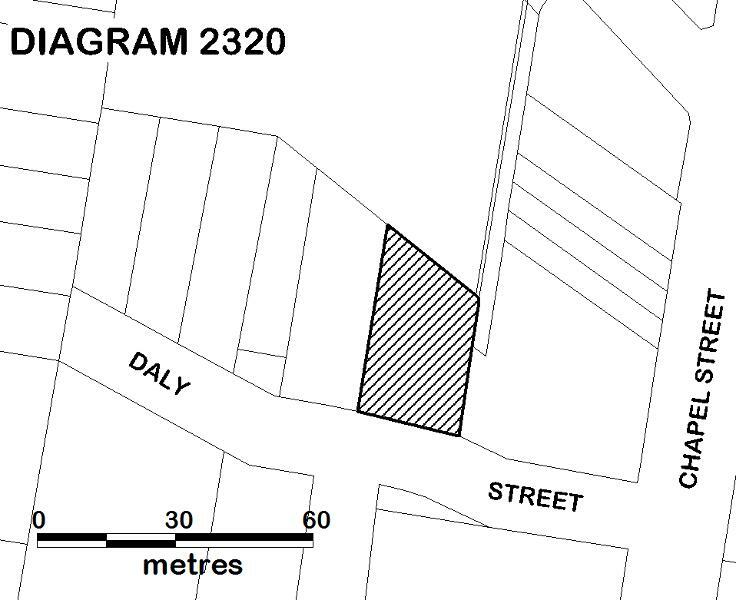 Daly Street was originally known as Tramway Street, which was a reference to the adjacent Melbourne Tramway & Omnibus Company (MT&OC) cable tram engine house and car shed built in 1887-8. The MT&OC, formed in 1885, ran one of the largest cable tram systems in the world, with about 75 km of double track on 17 routes radiating out from the centre of Melbourne to the surrounding suburbs. In 1916 the company surrendered its authority to the Tramways Board, the forerunner of the M&MTB, which took over the cable tram routes in 1920. The South Yarra substation was constructed at the rear of the engine house and car shed by the M&MTB in 1927, probably to the design of MMTB's architect Alan G Monsborough. It was one of a number of substations built in the mid-1920s as each section of cable tram route was electrified, including at Carlton, Camberwell and South Melbourne. The South Yarra substation was powered by a 500 KW rotary converter, which by 1942 had been replaced by a mercury arc rectifier. In 2005 Yarra Trams commissioned a number of new tramway substations and a number of old substations were made redundant, including South Yarra, and their equipment was removed. A new substation was built at the rear of the site. Since 2009 the 1927 building has been occupied by the ladies wear shop Le Louvre, which has involved refitting of the interior. John Keating, Mind the Curve! A history of the Cable Trams, Sydney 2001. Russell Jones for Friends of Hawthorn Tram Depot, 'From Rotary Converters to solid-state: tramway substation architecture in Melbourne', 2013; online at http://www.hawthorntramdepot.org.au/papers/substations.htm. Built in 1927, this one of five impressive electrical substations built in the 1920s by the Melbourne & Metropolitan Tramways Board as part of the electrification of Melbourne's tram system, and is attributed to the Board's architect Alan Monsborough. General Conditions: 1. All exempted alterations are to be planned and carried out in a manner which prevents damage to the fabric of the registered place or object. General Conditions: 2. Should it become apparent during further inspection or the carrying out of works that original or previously hidden or inaccessible details of the place or object are revealed which relate to the significance of the place or object, then the exemption covering such works shall cease and Heritage Victoria shall be notified as soon as possible. Note: All archaeological places have the potential to contain significant sub-surface artefacts and other remains. In most cases it will be necessary to obtain approval from the Executive Director, Heritage Victoria before the undertaking any works that have a significant sub-surface component. General Conditions: 3. If there is a conservation policy and plan, all works shall be in accordance with it. Note: A Conservation Management Plan provides guidance for the management of the heritage values associated with the site. It may not be necessary to obtain a heritage permit for certain works specified in the management plan. General Conditions: 4. Nothing in this determination prevents the Executive Director from amending or rescinding all or any of the permit exemptions. General Conditions: 5. Nothing in this determination exempts owners or their agents from the responsibility to seek relevant planning or building permits from the responsible authorities where applicable. Any interior works which do not affect original fabric and are not visible from outside the building are permit exempt. The new substation building at the rear is not significant and any alterations to the building are permit exempt. The 1927 substation building is largely intact externally apart from a glass addition on the west side and a small brick addition at the rear. All of the original equipment has been removed from the interior, and little remains internally to demonstrate its original function. Any interior works which do not affect original fabric and are not visible from outside the building are permit exempt. Any Minor Works that in the opinion of the Executive Director will not adversely affect the heritage significance of the place may be exempt from the permit requirements after registration through section 66 of the Heritage Act. A person proposing to undertake minor works must submit a proposal to the Executive Director. If the Executive Director is satisfied that the proposed works will not adversely affect the heritage values of the site, the applicant may be exempted from the requirement to obtain a heritage permit.